When was Muchelney Pottery first opened? John and Lizzie Leach established the pottery in 1965, 51 years ago. Who are the Muchelney Potters? 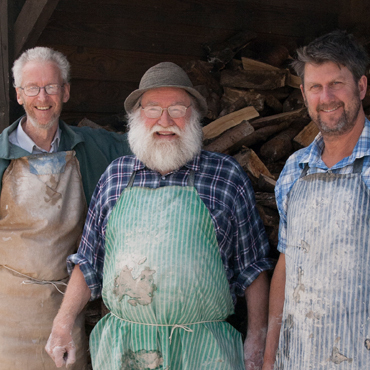 Master potters John Leach, Nick Rees and Mark Melbourne make up the pottery crew – they have approximately 120 years of experience between them in the craft of pottery. Where does the clay for the pots come from? The clay comes from pits in Devon, Dorset and Cornwall and is mixed to our own recipe. 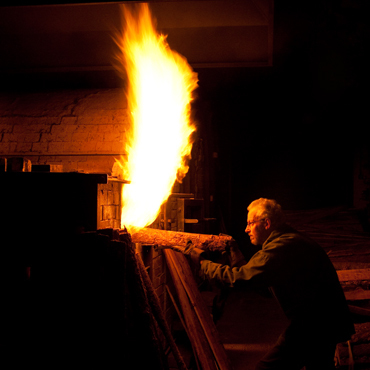 It is suitable for firing at 1320 ˚C to produce stoneware from our woodfired kiln. How are the pots made? Each pot is individually hand thrown on a potters’ wheel. When do you put a handle on a jug? When the pot is what we call 'cheddar cheese hard' or ‘leather hard’ - that is half dry. Can you ensure that the pots for the repeat range of Muchelney kitchenware always look the same? No- each pot is always unique with its own special qualities but sharing a recognisable common design concept. In order to regulate sizes however, we back up our visual judgment with a simple gauge. Do you decorate the pots? 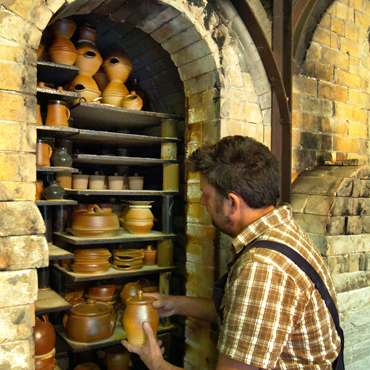 Our pots are mainly 'decorated' or scorched by the long snaking flames in the kiln. However we do use a wax resist process applying two glazes and incorporating some scratched designs on others. 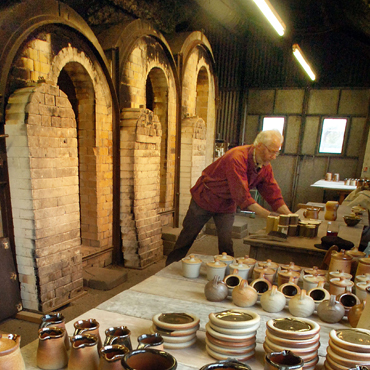 What gives Muchelney Pottery its distinctive look and colour? The 'toasted' finish on the pots is the spontaneous effect of woodfiring at very high temperatures – and is always an exciting discovery for us when we open up the kiln. What are the glazes made from? Felspar, limestone, quartz and clay mixed with water, which is applied to the pot by dipping or pouring. Can Muchelney stoneware pots be used safely for cooking and serving food? Yes – they are ovenproof and contain no lead in the glazes. They are also microwave and dishwasher-proof. And of course they retain heat very well. Do you sign the pots? The catalogue range of oven-to-tableware is sealed 'Muchelney'. John Leach’s individual designs have his personal seal on the base. Nick Rees and Mark Melbourne also sign their individual designs. How do you make the black pots? They are packed in sawdust inside ceramic lidded containers (saggars) which starve the sawdust of oxygen, therefore impregnating the pots with carbon during the firing process. They are placed at the bottom of the kiln chambers where it is marginally cooler. Do the pots need more than one firing? Yes, the first one is a biscuit firing at 1000 ˚C in an electric kiln to prepare the pots for glazing. The second firing is at 1320 ˚C in the wood-fired kiln. This strengthens the pots and produces an interesting wood fired finish. Who designed and built the wood-fired kiln at Muchelney? The present three-chambered kiln was designed by John Leach following a traditional Japanese climbing kiln and was built by the pottery team in 1998. How long does it take to fire the kiln? About 37 hours. Three potters at Muchelney plus three extra helpers take shifts to stoke the kiln with off cut wood and monitor the temperature. How do you know what the temperature is inside the kiln? We use an electric pyrometer, also ceramic rings covered with glazes which can be hooked out of the kiln during the firing for testing, and 'cones' (small pyramids made of glaze material) which melt inside the kiln at known temperatures. 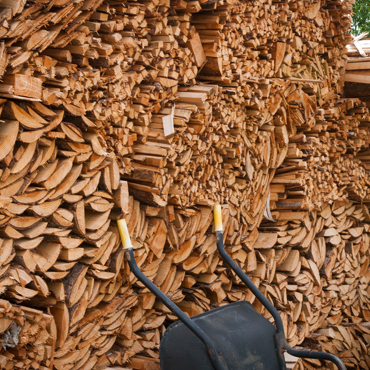 What kind of wood, and how much do you use in the kiln? We use Larch and Douglas Fir off cuts from sustainable plantations mostly in the West Country. Each firing consumes about 14 bundles (as seen in the yard) which have taken up to 18 months to season. How do you stack the pots in the kiln, and how many will it take? The pots are stacked on carborundum shelves according to size. In total we can stack about 2000 pots in the kiln’s three chambers. What can go wrong in a firing? Far too many things! Pots can fuse together if improperly stacked. They can crack or warp as the result of uneven drying or fluctuating kiln temperatures. Glazes can fail. We have to expect around 2% seconds from each firing. How many firings do you have in a year? We average six firings a year. 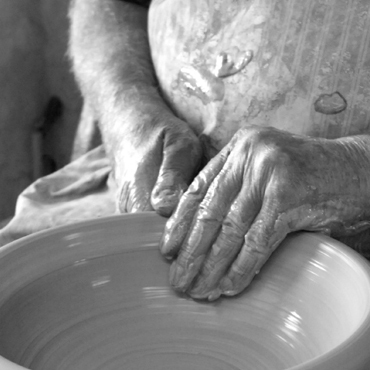 How can you become a potter? You can study at art college or university or take an apprenticeship at an established pottery. John Leach was apprenticed to his grandfather Bernard Leach and father, David Leach at St. Ives Pottery and also trained with Colin Pearson and Ray Finch. 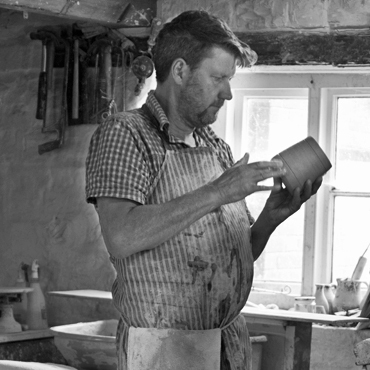 Nick Rees and Mark Melbourne were trained at Muchelney Pottery. Helpful tip: Why not read Ceramic Review and contact the CPA for a list of potters and ceramic artists.